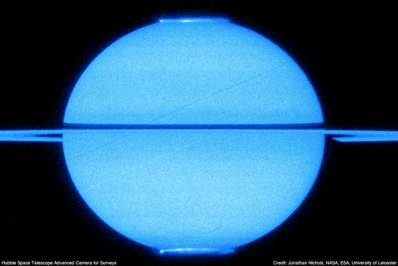 Using the Hubble Space Telescope to collect images of Saturn's glowing ultraviolet aurorae, space scientists have found that these displays pulse in time with Saturn's rotation. The rotation rates of planets like Earth are well known because they have solid surfaces on which there are fixed landmarks from which the rate at which they spin can be recorded. Gas giants, however, have no such solid surface, so their rotation rate refers to the rotation of the deep interior of the planet. Since magnetic fields are generated in the depths of these planets, observations of the magnetic fields and associated phenomena such as aurora and radio emissions provide a good indicator of the planet's rotation rate. Saturn's ultraviolet auroras are visible over each pole in this image obtained in 2009 using the Advanced Camera for Surveys onboard the NASA/ESA Hubble Space Telescope.�Image: Jonathan Nichols, NASA, ESA, University of Leicester. Radio emissions pulsating from Saturn were detected by the Voyager spacecraft and found to follow a period of 10 hours 39 minutes, which was thought to represent the rotation period of the planet. "However, subsequent measurements by later spacecraft have shown that over the years the pulsing of the radio period has varied significantly," team leader Jonathon Nichols of the University of Leicester tells Astronomy Now. "Since a body as large as Saturn cannot easily spin up or slow down, the conclusion is that the radio pulsing is loosely connected to the planetary rotation period but is being modulated by some as-yet unknown process. The hunt for this process is presently underway!" To help illuminate this mystery, Nichols and his team analysed images of the aurora captured by the Hubble Space Telescope between 2005 and 2009, finding that they are generally brighter when the radio emission is brighter. Auroras occur when charged particles from the Sun are funneled along a planet's magnetic field into the upper atmosphere near the poles, whereupon they are buffeted against atmospheric particles, resulting in an eerie glow. "The auroral emission itself is not causing the radio oscillation to vary, it is merely responding to the same process that is modulating the radio period," explains Nichols. "This is important because, first, it tells us that the aurora and radio emissions are physically associated with each other, as was long suspected, and second, we know that the auroras are caused by electric currents which flow around the planet's magnetic field and can be detected by the Cassini spacecraft presently in orbit around Saturn. This finding is therefore a 'signpost' telling us that by studying the electric currents flowing in Saturn's magnetosphere we may discover the mystery cause of the varying radio period." The team's work will be published in Geophysical Research Letters later this week.